The idea of sharing home with someone can be a little scary in the beginning. But this should NOT let you keep away from a roommate experience which might turn out to be totally opposite of what you actually thought. And moreover you will have great stories to tell your grandchildren and laugh about all those silly incidents. Thus, for all the good things to happen, you need to put in efforts and have patience to make it work..!! YOU NEED TO BE MORE CAREFUL..!! Check out for the tips below to turn that "stranger" into your "best roomi forever"..!! It might seem irrelevant to you at first but if you really want to save yourself from all the drama later, its better to discuss all the things at first go. Do discuss about the day to day activities, like cooking. cleaning, laundry, common space use etc. 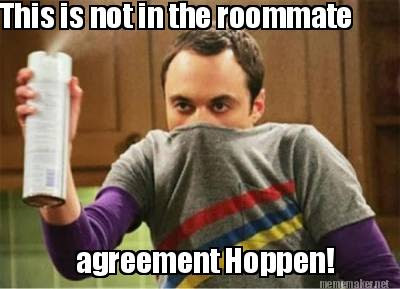 HOW ABOUT THE IDEA OF GETTING A LANDLORD NO INTERFERENCE AGREEMENT , JUST LIKE THE ROOMMATE ONE..?? It's better to have a discussion about the "plans for tomorrow" so that everything can be managed accordingly. For instance. you are planning for a party tomorrow and you told that to your roomi, and he had an important project to be finished by tomorrow, and that's how simply talking to each other you saved yourself from the pending nuisance. MAKE A PROPER SCHEDULE, AND WITH FULL DETERMINATION, GO FOR IT..!! MAKE PROMISES TO YOURSELF FOR YOURSELF. All the days are not the same, so give that personal time and space to your roommate and yourself, as and when needed..!! SPEND SOME TIME WITH YOURSELF AND "FALL IN LOVE, INSPIRED BY ROOMIES..!!" 4. SHARE LIKE YOU CARE..!! "return after use", "not to be used". This will leave no room for quarrel. THE MOST IMPORTANT THING TO BE SHARED IS BILLS. KNOW EASY WAY OF "HOW TO SHARE BILLS WITH YOUR ROOMI." Cleanliness is next to godliness, so try to stay clean and keep your surroundings too, because your mom is not here and you have to manage things at the end of the day. "HOW TO MANAGE THINGS WHEN YOU HAVE A MESSY ROOMMATE." You guys may be super cool with one another and say many sorts of things, but sometimes, staying in limits will not harm anyone, rather keep the situation in check. You might just hurt your roommate unintentionally, but you will hurt. So being extra careful the next you speak is beneficial, especially during heated arguments. ONE OF THE MOST DIFFICULT THINGS IS TO MAINTAIN RELATIONS IN SUCH A HECTIC SCHEDULE. SO HERE WE HAVE "IT'S ALL ABOUT MAINTAINING RELATIONS", AND KNOW HOW TO STAY IN TOUCH WITH EX-ROOMMATE. If you are thinking, ignorance is the best silence, then that is true but only up-to a limit. And after that ignorance will turn into ego problems, which will further lead to clashes and so on. Therefore, save yourself from this fiasco, and talk, it really does help..!! Talking solves out the problem in the first go and you get what you wanted..!! TALKING REALLY DOES HELP..!! TRY IF YOU DON'T BELIEVE IT..!! 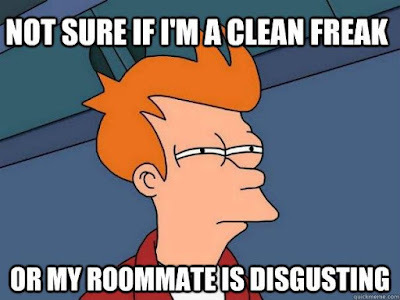 So guys, just don't shy away from the idea of having roommates. Just like I said there will be butterflies in the stomach but what's the fun if you don't try anything new and live the same monotonous way..?? Go ahead and experience the new, a small beginning, a small step towards a memorable journey..! !